Adjustable functions allowing to simmer or boil within instants, the Ancona Chef 36 inch induction cooktop will change your cooking experience forever. Displaying a stylish and minimalistic design, this induction cooktop features a wide range of heating levels for all type of cooking, as well as a Boost feature for rapid boiling. The electromagnetic field quickly reaches high temperatures, with integrated cookware sensors that prevent empty burners from heating up by accident. Built from high quality Schott Ceran., this German fabricated surface is easy to clean and maintain, while minimizing accidents and messy spills. The timer (auto-delay shut-off) function allows you to control your cooking time, and the lock function prevents any setting changes. The sleek design, powerful performance, and easy-to-use features, will revitalize your kitchen layout and cooking dynamic. Chef 30 inch Glass-Ceramic Induction Cooktop Adjustable functions allowing to simmer or boil within instants, the Ancona Chef 36 inch induction cooktop will change your cooking experience forever. Displaying a stylish and minimalistic design, this induction cooktop features a wide range of heating levels for all type of cooking, as well as a Boost feature for rapid boiling. The electromagnetic field quickly reaches high temperatures, with integrated cookware sensors that prevent empty burners from heating up by accident. Built from high quality Schott Ceran., this German fabricated surface is easy to clean and maintain, while minimizing accidents and messy spills. The timer (auto-delay shut-off) function allows you to control your cooking time, and the lock function prevents any setting changes. The sleek design, powerful performance, and easy-to-use features, will revitalize your kitchen layout and cooking dynamic. 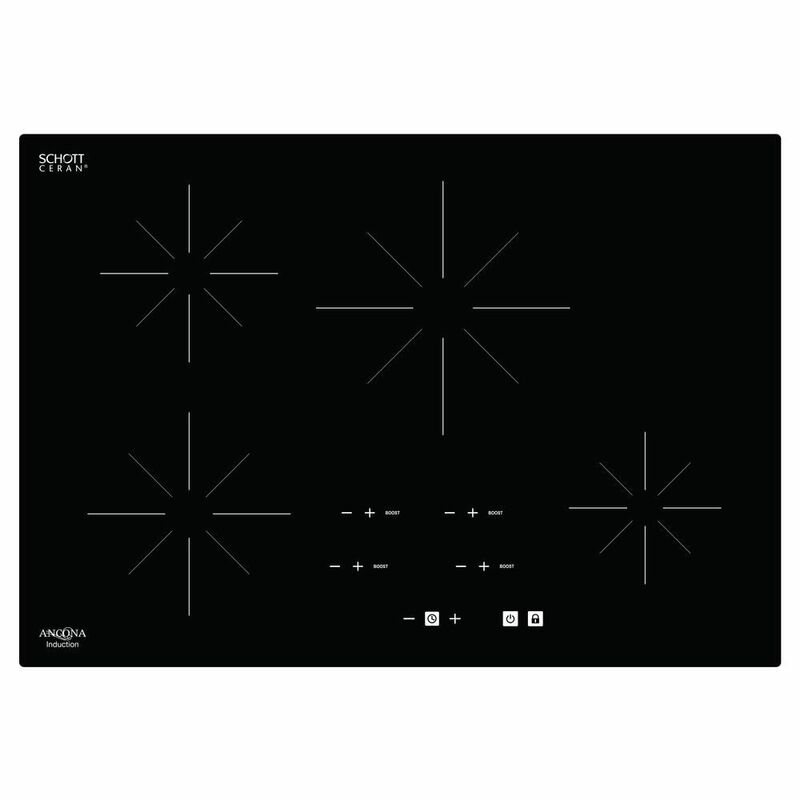 Chef 30 inch Glass-Ceramic Induction Cooktop is rated 3.5 out of 5 by 4. Rated 4 out of 5 by cloke50 from Sleek design, easy to install. We have had this stovetop for a month and so far are extremely pleased. Quick to heat and easy to clean. Rated 1 out of 5 by melm from Regularly turns off It would regularly beep and turn off while I was cooking. It was replaced by a new one and same problem occured. I replaced it then with a regular non-induction cooktop. Rated 4 out of 5 by Berit from I have been using the cooktop for about a month... I have been using the cooktop for about a month now and I love the fact that it is an induction cooktop. It heats up in seconds anything. The design is perfect on my island and I have no issues with the cabinet underneath. However it makes a loud noise when using. Rated 5 out of 5 by Dee from Easy to install, easy to use. Much more control than the regular electric cooktop I had. I don'... Easy to install, easy to use. Much more control than the regular electric cooktop I had. I don't burn things anymore. Water boils incredibly fast with the boost feature. The lock feature ensures safety, but is simple to unlock. The order process was simple. It arrived on December 23rd, electrician had it installed in about 20 minutes and we were ready for our holiday company to arrive. So glad that my husband got this for us for Christmas!